The 2013 Berlinale’s opening night film, is equal parts existential melancholy and gravity-defying action. It’s a line that sums up Wong Kar-wai’s much-anticipated historical martial arts epic. The Grandmaster, which will open the Berlin International Film Festival on Feb. 7, is an action-packed spectacle for sure — indeed, the film contains some of the most dazzling fights ever seen onscreen, courtesy of the action choreography of Yuen Woo-ping (of The Matrix and Crouching Tiger, Hidden Dragon fame) — but the Hong Kong auteur is seemingly more preoccupied with the introspective verbal exchanges between his battle-hardened warriors. While martial arts aficionados will find fulfillment with the fights — complete with more-than-explicit primers from some of the fighters themselves about the specialties of the art they practice — Wong’s art-house fanbase also will find much to savor, with the leading characters oozing the kind of longing that defines the filmmaker’s oeuvre. The suppressed affections between Ip and Gong Er, the young, headstrong northeastern fighter played by Zhang Ziyi, doubtless will mesmerize festival audiences converted to Wong’s aesthetics through In the Mood for Love. And beyond yearning of the romantic kind, The Grandmaster also is an evocation of the yearning for home from drifting individuals, with Hong Kong becoming a haven for fighters living out their last years after their forced departure from a politically tumultuous China (it’s hardly coincidental that the idea of the film was conceived as the director was putting final touches on Happy Together, his 1998 film about two Hong Kongers living in self-exile in Buenos Aires just around the time of the former colony’s transition to Chinese sovereignty). It’s a sentiment which should play well with audiences in the director’s hometown. If they are patient enough to draw such meanings from the film, that is. Since Wong first announced the project in 2002, the life of Ip Man — a real-life master who was responsible for the development of the Wing Chun school of martial arts, of which a teenage Bruce Lee was a student — already has found its way to the screen with Wilson Yip’s Ip Man and Ip Man 2. Offering a more straightforward account of Ip’s life, those films are distinctly more accessible than The Grandmaster, with actor Donnie Yen generating critical acclaim not just for the action but also for a measured performance revealing the man behind the moves. 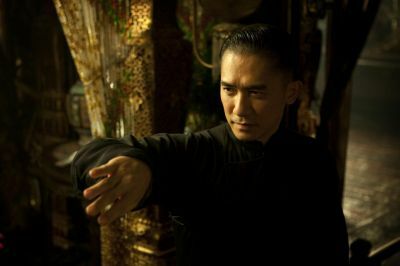 This has certainly left a mark on Wong’s pursuit of The Grandmaster, with recurrent reports through the years of how the director was working to move his brainchild away from being just an Ip Man biopic. The project has traveled under the title of The Grandmasters for a certain period of time (the pluralistic title remains on the poster at the main Web page of Wong’s production company Jet Tone Films). Indeed, it would have been a more appropriate title: While Ip’s perception of the world somehow frames the narrative — through voiceovers accounting for his background and his observations of life and characters around him — the final two-hour cut dedicates sizable screen time to Gong Er’s story, with other masters weighing in with their own philosophical and physical nuggets as well. The film’s first half-hour is definitely Ip’s (and Leung’s), though. Set in Foshan, the section first lays down Ip’s backstory, with his narration about his childhood and his marriage juxtaposed with images of a young Ip being initiated into martial arts by his teacher Chen Heshun (played by Yuen Woo-ping himself) and then intimate sequences of Ip’s contented domestic life with his wife Zhang Yongcheng (Korean actress Song Hye-kyo). Ip’s voice then leads the viewer to the Golden Pavilion, a lavishly appointed establishment, and brothel, which serves as a 1930s version of the tavern in old-school martial arts films. Ip is contracted into a duel with Gong Yutian (Wang Qingxiang), a martial arts master from northeastern China looking for a last fight (and a consolidation of the supremacy of his school over its southern rivals) before he retires. When Ip emerges victorious, Gong’s daughter, Gong Er, challenges Ip to a fight to restore her clan’s reputation. She satisfies her hunger for a win, but also finds herself subjected to another craving: With her and her opponent’s limbs winding up all entangled (and some parts of the fight shot beautifully in slow motion), their yearnings begin. But it’s at this point that Ip recedes into the background and Gong Er is allowed to take over. Shifting to her hometown in Japanese-occupied northeastern China in the late 1930s, the story kicks into play again as Gong Yutian dies after a confrontation with Ma San (Zhang Jin), his estranged ex-protege. Gong Er vows to avenge her father’s murder in the face of much disparagement from her misogynist elders, who tell her to let things lie and get married. In one of their last meetings, Gong admits to having once harbored amorous feelings for Ip. But it’s a confession that leads to nothing. Just as significantly, she also tells Ip about what her main regret in life is — that she has yet to see life as it is, and asks Ip to do so on her behalf. Ip has survived all to tell the tale, albeit in a solitude shared by many of Wong’s forlorn protagonists in previous films. 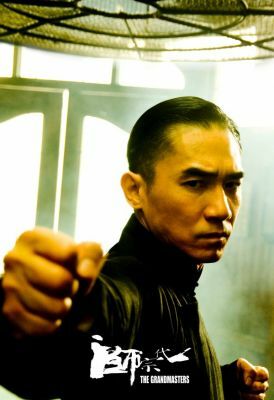 Putting Ip in a suit and tie in one of the film’s final scenes, it can be said that Wong might be evoking Chau Mo-wan, the fictional 1960s martial arts novelist whom Leung plays in In the Mood for Love. While Zhang Ziyi’s Gong Er is more or less complete and coherent, the same can’t be said of some of the other characters, such as Chang Chen’s Razor, an expert of the Bagua school who is supposed to be another of the grandmasters. Song Hye-kyo’s Madam Ip has only a cursory presence and is basically rendered invisible in the film’s second half. It’s a situation brought about reportedly by the long gestation of the film — rumors are that the Korean actress couldn’t fit additional filming into her schedule — but it also undermines Wong’s efforts to provide a fully realized, nuanced account of Ip’s emotional torment. Still, The Grandmaster offers audiences much to marvel at visually. Production designer William Chang Shuk-ping has come to Wong’s aid with sumptuous sets, ranging from the pompous Golden Pavilion to the stunning snowscapes in which Gong Yutian’s funereal march takes place. Philippe Le Sourd’s cinematography brings Yuen’s scintillating action sequences into sharp focus — a crucial factor given Wong’s penchant for close-ups that can seemingly reveal a universe in the burning tip of a cigarette. True to Wong’s style, The Grandmaster is infused with melancholy and a near-existentialist resignation to the uncertainties of fate. Even though we know that Ip eventually will prosper — Wing Chun is now one of the most well-known martial arts schools in the world — Wong’s version of Ip ultimately is a portrait of a sad, isolated figure. Wong seems to be saying that Ip may be the last one left standing, but he is not necessarily the one who wins, after all.